You will be picked up from your hotel btw. 19:00 and 20:00 to transfer to the ship. Sail up the Bosphorus, the waterway between Europe and Asia, passing under the suspension bridges and viewing Ottoman summer palaces, waterside mansions and modern villas which line the European and Asian coasts. 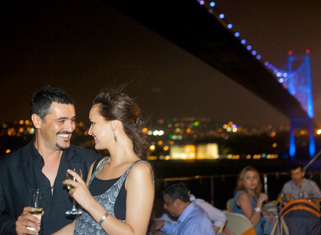 The panoramic view of Istanbul by the Bosphorus at night and dinner will both be memorable. Transfer to hotels at midnight. (03 - 07) 50 % discount.